Even before I joined the dig at the Wylie House Museum, I knew my concept of archaeology—mostly dinosaurs, mummies, and Indiana Jones—was tragically oversimplified. Still, I didn’t know how oversimplified until I started working alongside some real archaeologists uncovering circa-1859 greenhouses. 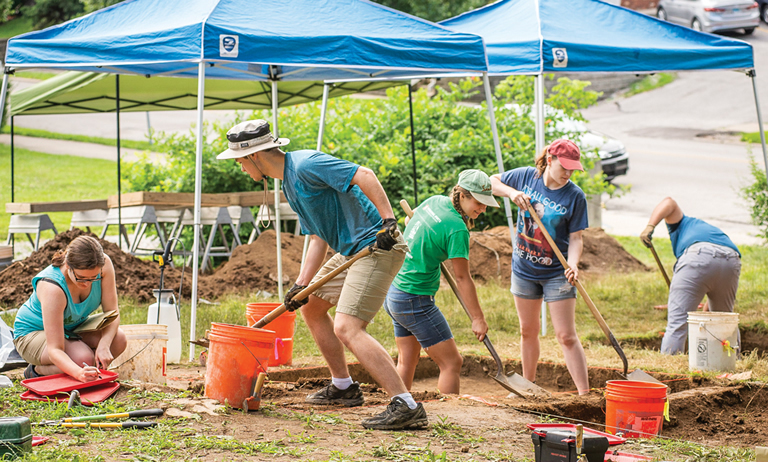 The museum, 307 E. 2nd St., opened the dig to the public in June with a series of Community Volunteer Days. “It started with a grant through the Indiana University Office of the Bicentennial,” Wylie House Museum Director Carey Beam explains. To date, students have found broken serving dishes, several buttons, glass, and even a small, metal horse. If they encounter bone, they must take care not to damage it, and it must be separated from other artifacts.